This blog was originally published on July 24, 2013. Libraries and museums can engage, teach and delight children. But too often these institutions are not part of the policy conversation about early education. A new report – “Growing Young Minds: How Museums and Libraries Create Lifelong Learners” – calls for tapping and investing in more of the strengths and knowledge of these vibrant institutions. The report comes from the Institute of Museum and Library Services and the Campaign for Grade-Level Reading. – Museums and libraries provide high-quality, easily accessed early education programs that engage and support parents in being their children’s first teachers. – Visitors find literacy and STEM (science, technology, engineering and math) programs that help children develop executive function and learning skills. – Museum and library programs can add capacity to early learning providers. – Comprehensive programs provide families with information about health and nutrition as well as offering physical activities. – Federal policy makers can leverage grants that help museums and libraries become even stronger partners. – State policymakers can include museums and libraries in the effort to increase access to early education programs. 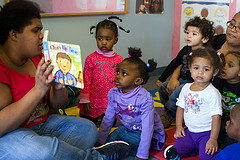 “With the goal of meeting educational standards and enriching units of study,” Lesaux writes that libraries should “consider programming in partnership with early education and care settings, and also with schools.” She also calls on libraries to reflect the cultural diversity of their communities through “bilingual staffing, programming, signage and materials” so that they can more effectively promote family literacy. EEC also has Early Childhood Resource Centers located in five public libraries across the state. While libraries and museums serve millions of families a year, the challenge is always to reach more, especially children who have fewer resources at home.